A physical examination is an essential part of being responsible for your own health and well-being. A physical from our board certified NYC physician affiliated with New York Presbyterian Hospital will provide you with excellent care, educational materials and the dedication you deserve. Too often adults stop getting physical exams in New York. Why? The main reason we’ve observed is that they simply don’t think they need it or they are just too busy. The only time they end up going to the doctor’s office is when they need a prescription or catch a cold. This is an extremely vulnerable line of thinking. Physical Exams in NYC are Partly Covered by Insurance Plans! As you are getting older it is even more important to visit the doctor for a full physical exam. We will evaluate your current health with tests and evaluations and then compare the results with your past history. It’s the only way to accurately learn more about your health. Please call your insurance carrier check eligibility and amount of possible co-pay. It’s easy to pick up the phone and call our office. We promise to provide you with availability during regular business hours. 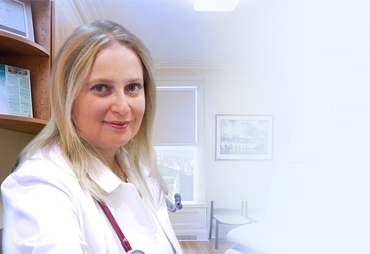 Dr. Gafanovich is an excellent top rated physician in the NYC area. She makes sure that you are comfortable, and that you understand the results of your exam. This means all the complicated jargon that medical professionals use will be laid out plainly so that you can understand it. Remember, no question is left unanswered. Remember, do not hesitate to ask or call because the basic premise of being proactive in your health care starts by asking questions. Becoming an apt and astute observer of your own health requires responsibility. When you come to Manhattan Physical Exams, you take a proactive approach. Don’t wait to come to us when you are sick. We ask that you make it a priority to take your health into your own hands. Prevention is key. What makes a routine physical exam with a new doctor better than any other? Here are Dr. Gafanovich’s office patients are welcomed by a multilingual staff who understand the needs of patients. Plus, the staff and the doctor believe in patient education and are committed to give you all the options to stay in good health.